WASHINGTON (CNN) -- Cost overruns on big-ticket Pentagon projects have left the U.S. military facing a budgetary "train wreck" at a time of growing budget deficits, Sen. John McCain said Tuesday. 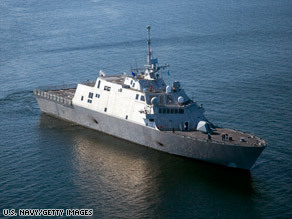 A Littoral combat ship is tested in July. The cost to build the ships more than doubled, according to a report. McCain and Sen. Carl Levin, D-Michigan and the chairman of the Senate Armed Services Committee, said the cost of 95 major weapons systems -- ships, aircraft and armored vehicles -- have ballooned by a total of 30 percent in recent years, to about $1.3 trillion. The senators announced an effort, including legislation, to rein in that spending and tighten Defense Department oversight. With U.S. troops fighting two wars overseas and personnel costs dominating the defense budget, "We're facing a train wreck," said McCain, the ranking Republican on the committee and the GOP's presidential candidate in 2008. "We cannot continue on this path of escalating costs without at some point making some tough choices, which may endanger our nation's security," he said. McCain and Levin singled out the Navy's planned construction of Littoral combat ships, a class of small vessels designed for coastal operations, for particular criticism. Levin said the ships are "way beyond" their projected construction time of two years, and the program has grown from a cost per ship of about $220 million to more than $500 million, according to a November report from the Congressional Research Service. "We can't have a ship that's a small ship that's supposed to be built in two years run completely out of control to double or triple or quadruple its original cost estimates," McCain said. He also criticized the planned purchase of 28 new Marine helicopters for the White House that he said cost "more than Air Force One." But White House spokesman Robert Gibbs said Tuesday that President Barack Obama has put that $11 billion order on hold. Pentagon spokesman Bryan Whitman said Tuesday that the Defense Department is committed to reviewing its big-ticket contracts, "particularly those programs that are underperforming." The presidential helicopter project "is one of those programs," he said. Levin and McCain said their push will include hearings into military contracting, legislation creating new watchdog posts in the Pentagon and an effort to stiffen congressional oversight of big-ticket programs. "The Department of Defense has the major responsibility to make sure that these programs are run efficiently. Congress has an oversight responsibility," Levin said. "Neither of those activities have been carried out adequately." Their announcement comes as Obama is scheduled to deliver his budget address to Congress, and Defense Secretary Robert Gates is already examining whether to cut back on some of the armed services' biggest purchases. "This moment also presents an opportunity, one of those rare chances to match virtue to necessity, to critically and ruthlessly separate appetites from real requirements," Gates told a Senate hearing in January. Among the other items under scrutiny: The $950 billion joint strike fighter program, the Army's $200 billion Future Combat System and the Navy's Virginia-class attack submarines. "We are going to have lots of fights in the next two or three months over various parts of the defense budget," said Winslow Wheeler, an analyst for the nonprofit Center for Defense Information. The plans have leading defense contractors and members of Congress with contractors' factories in their districts already arguing to keep their programs intact. Lockheed Martin's F-22 program, for instance, employs about 12,000 people in 44 states, its supporters argue. But Wheeler said defense spending produces "significantly less" employment than spending in other areas, such as mass transit or health care. CNN's Barbara Starr and Mike Mount contributed to this report.